Spotted spurge is a low-growing native plant. Spotted spurge is a low-growing plant native to eastern North America that is usually considered a weed in gardens, cultivated agricultural areas, and disturbed sites. It will grow in almost any open area, including waste ground, roadsides, pastures, open woods, in sidewalk cracks and in thin lawns. It often grows in poor, compacted soil and generally in full sun. This summer annual in the spurge family (Euphorbiaceae) can overgrow and smother desirable plants. 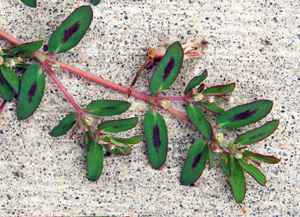 Other common names include spotted euphorbia, spotted sandmat, milk-purslane, and prostrate spurge. This latter common name, however, usually refers to a very similar, but different species of plant. The taxonomy of this group of plants is rather confused, partly because many of the species are similar in appearance. Some authorities consider them to be in the genus Euphorbia, while others assign them to the genus Chamaesyce. 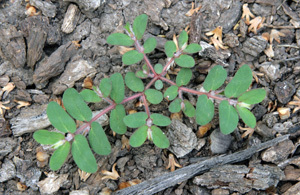 Chamaesyce maculata is the name used in the USDA’s Plants Database (http://plants.usda.gov/), but other authorities use other scientific names including Euphorbia maculata, E. supina and C. supina. 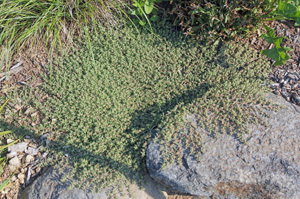 Spotted spurge can form large, dense mats. Spotted spurge forms a rangy to dense mat of foliage radiating from a central taproot up to two feet long. Plants are prostrate to ascending, and under ideal conditions a single plant can grow up to 3 feet across. Seeds germinate best in warm soil when temperatures are above 75F, although it will sprout at cooler temperatures when moisture is available. The seeds need light to germinate, so seeds more than half an inch deep in the soil are unlikely to germinate. 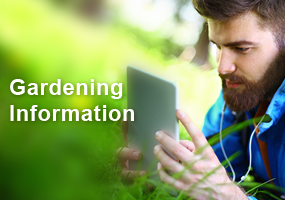 These low-growing plants tend to develop slowly, and often are not noticed until late summer. Plants are killed by frost. The leaves often but not always have a red spot in the middle. The ovate, slightly hairy, dark green leaves grow in opposite pairs along pink to maroon, hairy stems. The leaves usually have a red spot in the middle of the upper leaf surface, but this marking is not always present (<5% of plants). The stems branch out from a central point and do not root at the nodes. They secrete a milky sap (characteristic of the euphorbia family) when broken. The sap is a skin irritant to susceptible people and is highly toxic to sheep. The tiny, relatively inconspicuous flowers are grouped in cyathia in the leaf axils where the leaves join the stems. Each flower lacks petals, having only stamens or pistils. The flowers and fruits of spotted spurge are small and inconspicuous. 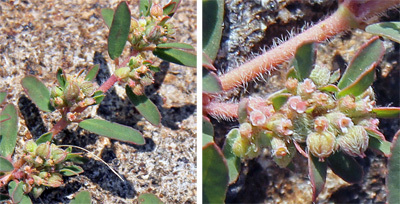 Several male and one female flower are aggregated into each cup-like cyathium with white to pink petaloid appendages. The flowers are followed by small fruits. The tripartite seed capsule contains one seed in each of the three locules. Each minute brown seed (1mm long or less) is distinctly hairy with longitudinal ridges or wrinkles. The seeds are hydrophilic, sticking to surfaces when they get wet (including animal fur, human’s shoes, etc. which help disseminate the seeds). Spotted spurge produces seeds quickly and prolifically. 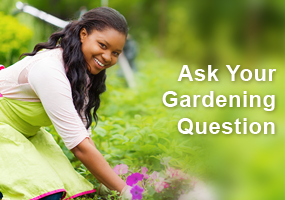 Plants can begin producing flowers and seeds in just over a month after germination under ideal condition. Thousands of seeds are produced by each plant, which can germinate immediately, the following spring, or remain dormant in the soil for years. A young spotted spurge plant. The best methods for controlling spurge in gardens are to prevent germination by mulching and to remove plants as soon as they are noticed. Organic mulches, such as shredded bark, compost or straw at least 2″ thick will eliminate the light needed for spotted spurge seed germination, although this will need periodic replacement. 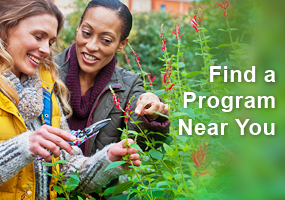 If plants do sprout, hand pull or hoe out plants, preferably before they produce seed. Loosen the soil beneath the foliar mat to remove the root, as the plant can regrow from the crown if the stems are just broken off. Gloves should be worn when hand pulling to prevent getting sap on the skin since the sap can be a skin irritant on sensitive individuals; also it is sticky and relatively hard to wash off. Avoid purchasing ornamentals that have spotted spurge growing in the containers that would introduce seeds into your garden. Hand pulling is best when spotted spurge is growing among other plants. 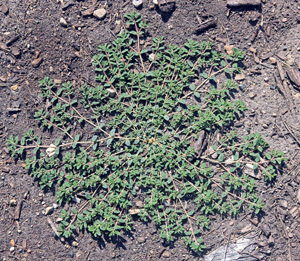 Pre-emergent herbicides can be used in areas where spotted spurge has been an ongoing problem and mulching is not feasible, but should not be used in a vegetable garden unless labeled for use on food crops. These will only be effective before the seeds have sprouted so should be applied before soil temperatures exceed 60F. Non-selective herbicides, such as glyphosate, can be used on larger plants, taking care to avoid contact with desirable plants. But if only the foliage is killed they may grow back from the roots. 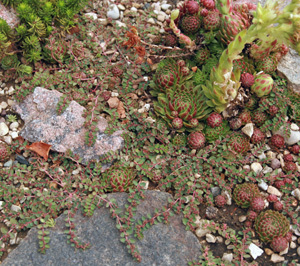 Spotted spurge is only a problem in thin lawns, so the best means of preventing it from becoming a problem is to maintain a thick, healthy turf through proper mowing, fertilization and irrigation. Small infestations in lawns can be removed by hand, but for more widespread infestations herbicides may be more practical.